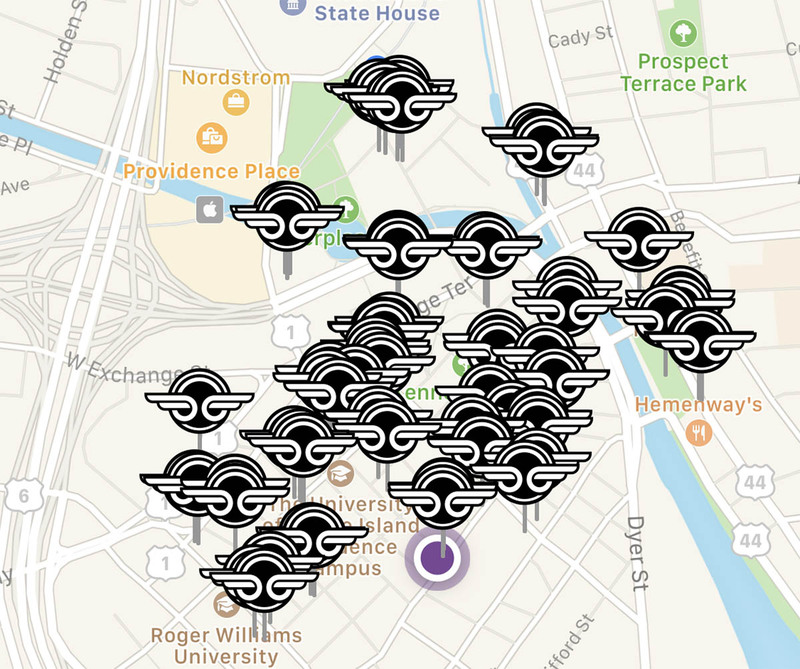 If you live or work in Downtown Providence, you’re probably aware that a fleet of dockless scooters arrived downtown (or landed in company parlance) overnight. 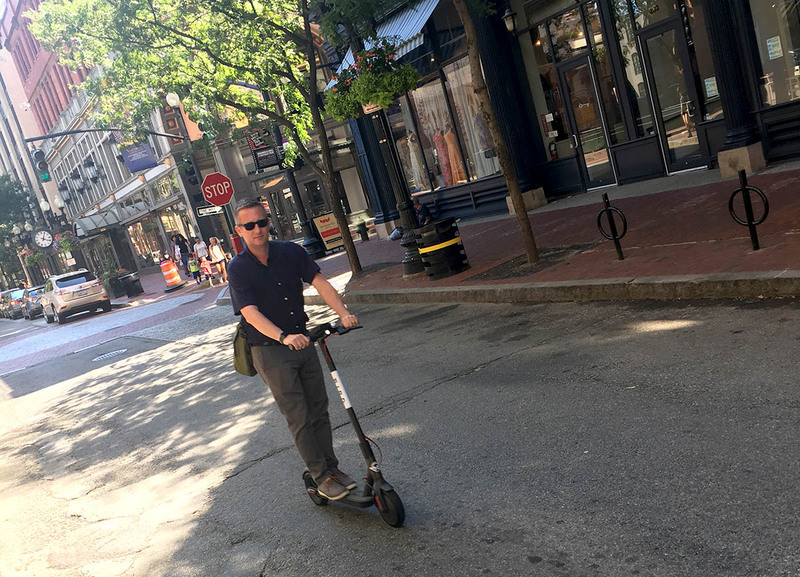 A day after the announcement of sponsors for Providence’s upcoming semi-dockless electric bike share system by JUMP; Bird has launched a dockless electric scooter share in the city. The Bird scooters are available through their smartphone app (of course). App users can see a map of scooter locations, and once they reach a scooter, activate it for $1 and ride for 15¢ per minute. Fully charged, the scooters have a range of 15-20 miles or one-and-a-half hours. Maximum speed of the scooters is 15mph. They are available from 7am to 9pm daily. After 9pm, the scooters are collected by Chargers (independent contractors) who recharge them then re-deploy them to designated Nests the following morning. The Nests are where Bird determines three or more scooters should be placed for morning riders. At the end of their ride, riders can leave them anywhere but are told by Bird through the App to leave them on sidewalks, outside of the right-of-way, suggested near bike racks, trees, planters, etc. If a scooter is left too far out of the service area (which is currently downtown Providence) it is placed out-of-service for a Charger to collect and re-deploy in the service area. People can contact Bird (contact information is displayed on every scooter) to request a location become a Nest, or request a location stop being a Nest. Bird suggests all riders wear helmets when riding their scooters and will send registered uses one for free. Bird lists a number of rules on their App (I did not sign up for an account yet, so I have not reviewed their full rules and conditions), though these say they are local regulations, they appear to be the same everywhere. Bird launched in Cambridge, Mass today too, and the rules above were the same there. One rule that was confusing people on Twitter was the need for a valid driver’s license. Bird uses your license to verify your age, riders must be at least 18. They might should come up with another way to confirm age for those riders who don’t have a license, presumably a state ID would work as well. 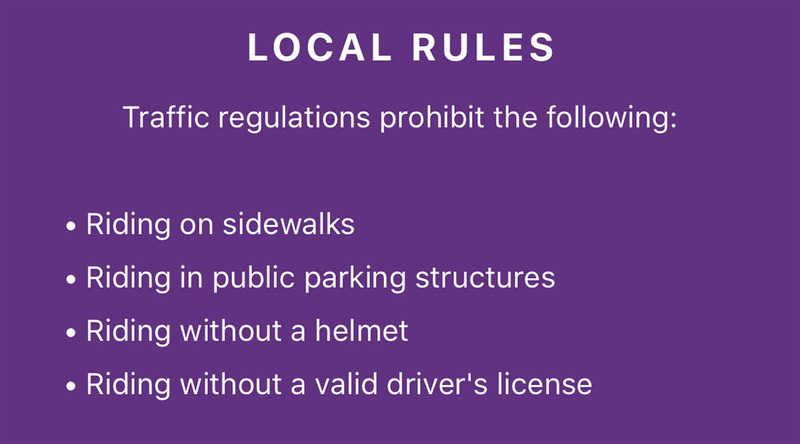 I asked about the helmet rule, we do not have one even for motorcycles. Sam told me he believed there was an under-21 rule for helmets on motorized-scooters, I haven’t had a chance to look into that. I did already see the no riding on the sidewalks rule broken today. Bird says they have safety ambassadors who move scooters left improperly, give out helmets, and talk to riders about other safety issues. I asked if they had talked with anyone in City government before they launched the system. They said they did not, but have talked to them today. I have not had a chance to talk to anyone in the City about the City’s reaction. Bird says they research laws in given jurisdictions to ensure they have a legal right to operate and launched upon that assumption in Providence. I asked what happens when it snows. So far, no Bird system has been in a snow-belt city over the winter, they were only in California this past winter. They have reacted to non-snow weather events in other cities (such as torrential rains in Miami) by shutting down the system and in some cases collecting the scooters if need be. The assumption is if a big blizzard is on the way, they will do the same here. Riding them? It was kinda fun, a little bit scary, they’re pretty peppy. They do have a hand break to stop you. I love them here in L.A. ..I’m just extra careful looking both ways and being aware of any cars, people, or potholes etc.. and I feel pretty safe. I’m glad Pvd got them. I work in providence and watch every day people riding them in the middle of the road not looking and with out helmets . I don’t think your rules are working ….